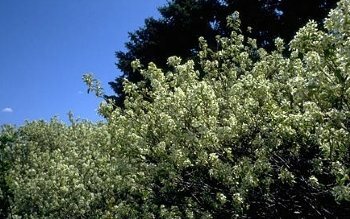 JUNEBERRY- a small to medium, suckering shrub which may reach a height of 8-10 feet. White flowers followed by an edible fruit in late June to early July. Also known as serviceberry or Saskatoon. It is native to the Northern Great Plains, Intermountain west, and Canada. Self pollinating.